Dr. Barbara Ollech has been providing compassionate and comprehensive dental care for Rockland County patients of all ages in Rockland County for more than twenty years. She understands how precious a healthy smile is, and that your smile is an outward expression of the inner you. In order to help her patients maintain optimal oral health, Dr. Ollech spends time listening to each patient and carefully assessing individual needs. Her commitment to excellent esthetics, function and health is the driving force behind the personalized care she gives all her patients. Click here for Dr. Ollech’s Facebook page. A graduate of the Fairleigh S. Dickinson College of Dental Medicine, Dr. Ollech earned the degree of Doctor of Dental Medicine in 1988. She supplemented her training at Long Island Jewish Hospital with fellowships in Geriatrics and Special Patient Care. In 1996, she completed a year of post-graduate training at New York University in Full Mouth Rehabilitation. Dr. Ollech has completed a rigorous program at the Dawson Center for Advanced Dental Study in St. Petersburg, Florida. This included training in evaluation of TMJ disorders (TMD), occlusion (bite), and muscle dysfunction. She learned how to use advanced methods such as Doppler studies, MRI and T scan to address TMJ problems beyond the scope of what most dental offices provide. This allows her to better diagnose and treat headaches, bite problems and jaw pain. Dr. Ollech completed advanced training with the Seattle Institute and Spear Education as well as at the Cosmedent Center in Chicago, training in the latest techniques in cosmetic dentistry and implant restoration with some of the top dentists in the country. 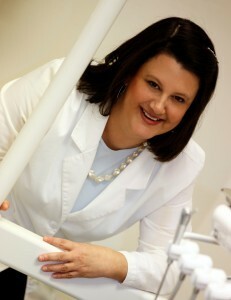 She has trained in Sedation Dentistry, and treatment of Sleep Apnea as well. Dr. Ollech combines the treatment for facial esthetics with relief of TMJ pain and headaches using Botox and other therapies. She and her team have been through Dental Boot Kamp as well as TOPS Total Patient Service training to develop communication skills and excellence in patient service. In a survey of her peers, Dr. Ollech has been awarded the honor of Top Dentists of the Hudson Valley every year from 2008 through 2016. Dr. Ollech serves as a founding board member of the Grater New York Academy of Cosmetic Dentistry, providing education and leadership to her peers in the tri-state area. See Dr. Ollech can do for you at Rockland County Dental Design! Call us or schedule an appointment online.